How do you guys feel about the word vignette? Someone once told me that they hated that word and I don’t know, maybe you’re not a fan either but I bet you’re a fan of the meaning! The dictionary says (among other things) that a vignette is : “any small endearing scene”. Isn’t that a nice thought? Because creating small endearing scenes in your home creates atmosphere and creating atmosphere sets the stage for all those warm memories that give us a sense of place …what’s not to love about that? But now that Halloween is over, I like to welcome friends and family who drop in, with a little Thanksgiving welcome! It’s too late in the season for me to buy more mums so I used the ones that were still in bloom and brought my crotons to the front porch. (They don’t like the cold but if you live in the deep south and the plants are close to the house and out of the wind, they’ll do fine for a couple of weeks into November…if not, just bring them inside at night or put them out only when you’re hosting a get-together) And again, the wreath stays because why change it!? The word vignette doesn’t bother me. However, I tend to use arrangement or display, in “real life”. Vignette or vignetting is also a photography term. Your porch is wonderful. Great inspiration. Your house looks very welcoming. I have neglected the front for quite a while. It certainly needs a big boost – you’ve given me some ideas. Thank you. What a pretty entrance and that door is absolutely gorgeous. 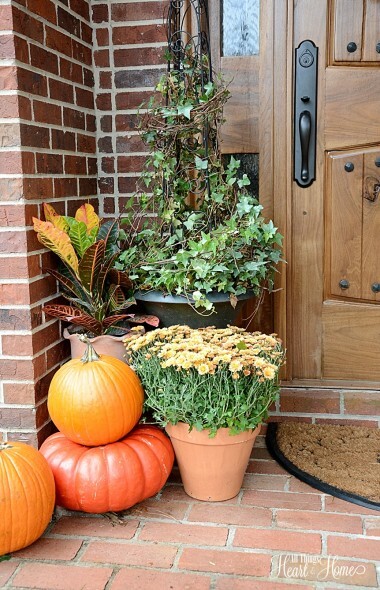 Your front porch is gorgeous with all its fall colors! So welcoming to family and friends. 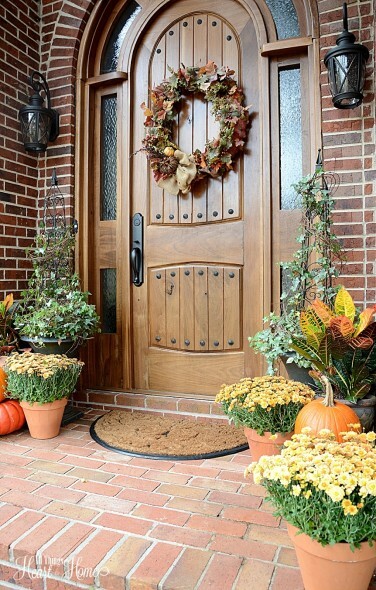 Your porch entrance is beautiful! So welcoming and so lovely! What a gorgeous front porch you have! 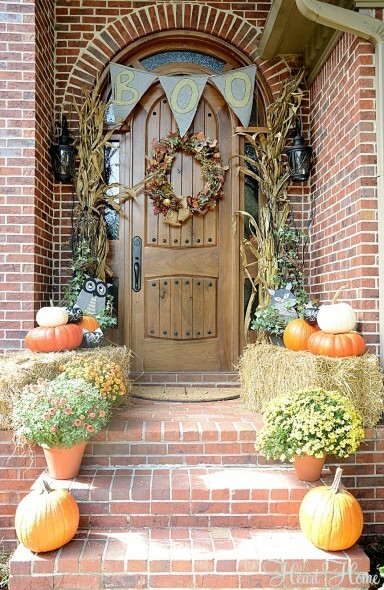 I just love how you’ve layered all the plants, mums, pumpkins, etc. Glad to have been on the vignette tour with you! 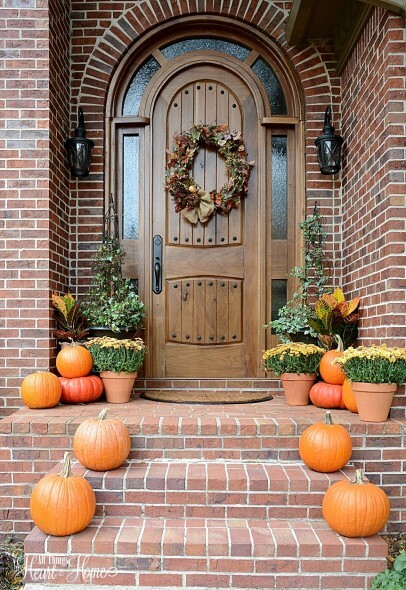 What a gorgeous front door and I love how you decorated it… definitely very inviting! Wow, what a gorgeous front door!!! 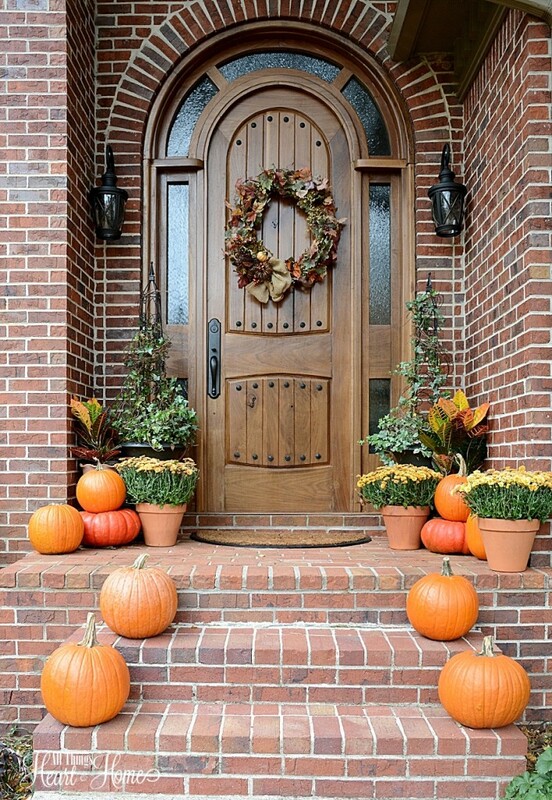 I love the steps too and how you created such a welcoming front porch. I adore everything you do with that beautiful front door of yours (and everything in your home, really) I am just beyond excited to see what you have planned for Christmas! Beautiful door! Who makes it and where was it purchased?